I am VERY impressed with the artwork for The Last Unicorn, both inside and out. (You know the drill, sometimes they get Alex Ross to do the cover and the rest of the book I could have sketched with my toes…or not.) It’s reminiscent of the Rankin & Bass production…so much so that it even LOOKS like you’re watching an enhanced versions of the film. (Because the comic’s art blows the film’s art away.) 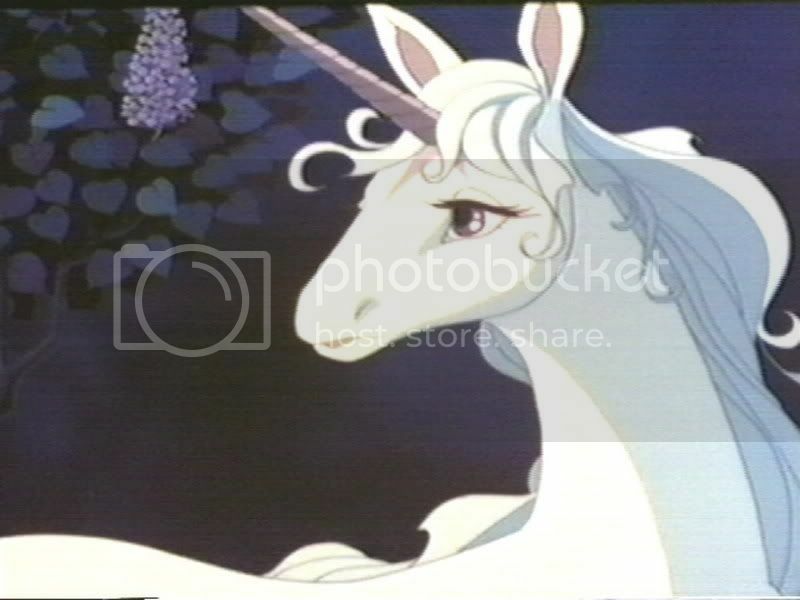 I can hear Mia Farrow’ voice as the unicorn’s soliloquy, because the unicorn LOOKS JUST LIKE the unicorn from the film. Is that sort of thing allowed? I wonder if they had to get some sort of permission or something to make the images exactly the same. I mean, it must have been on purpose, right? I have to say, I’m actually quite surprised. I would have been fine with — even welcomed – a new, different image of the unicorn. There have been so many over the centuries…what’s one more? Perhaps Amalthea really is the last. But this Princess refuses to believe it.